Well, okay not everything, but many things can be taken to a new level with a little bacon added. I recently discovered that meatloaf is one of those things. I grew up eating a lot of meatloaf and I make my family meatloaf often. I even have a great basic meatloaf recipe on my site. But meatloaf is one of those things that can be a bit boring. There are only so many different ways to make meatloaf, or so I thought. 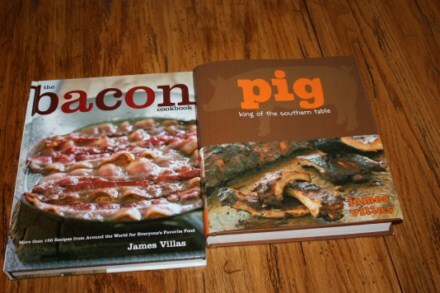 When I bought my pork cookbooks last year, I learned a lot about pork and bacon and the many ways to use it. One of the things that I learned about was bacon wrapped meatloaf. I really had never thought to add bacon to my meatloaf, let alone wrap it in bacon, but once I read about it, I knew I had to try it. And I am so glad that I did. 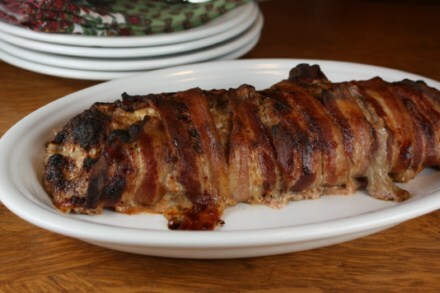 Wrapping your meatloaf in bacon takes it to a whole new level. It is so good. Really this works for just about any meatloaf recipe. You simply wrap bacon around your loaf before cooking it. It is that easy. The bacon cooks as the meatloaf cooks. If you like meatloaf and cook it often, but are getting tired of the same old type of meatloaves, you need to give this a try. It really is good! Yummy stuff for sure! The Pioneer Woman’s meatloaf is wrapped in bacon. That’s what got me started, and I love it. That sounds really good. You might want to go to my blog and see what I put on my meatloaf. Thanks. This looks seriously delicious. Thanks for posting! I forgot to tell you where to look at my meatloaf. Sorry. My blog site is: http://www.peggyspantry.blogspot.com.